Caryopteris x clandonensis is a small spreading shrub and is one of the most useful and attractive autumn flowering shrubs. All species have blue flowers in different shades, foliage differs from a mid to deep green through to a lime green. All flower from late summer to autumn, adding great colour near the end of the season. 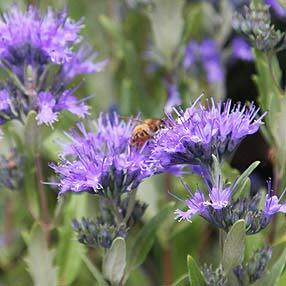 Deep blue flowering varieties are particularly attractive, and these drought tolerant plants are easy to prune as well. Good border plants, or use them a low hedge, and bees love the flowers. Wholesalers offer a number of varieties, most are low growing to under 1m in height and all are hardy, drought tolerant and sun loving. C. x clandonensis ‘First Choice’ – Deep blue flowers from late summer through to late autumn. To around 80cm in height with a similar spread. C. x clandonensis ‘White Surprise’ – Olive green leaves margined with creamy white, pale to mid blue flowers and reaches around 1m in height. C. x clandonensis ‘Worcester Gold’ – Golden lime green foliage with mid blue to mauve flowers. C. x clandonensis ‘Bluebeard’ – Taller growing to around 1.5m, deep purple to blue flowers.